Days of Our Lives Spoilers: Abe and Gabi Resort to Tricks! Days of Our Lives Spoilers, Wednesday, May 10th: Abe and Gabi Resort to Tricks! Abe and Valerie in the Days of Our Lives spoilers. 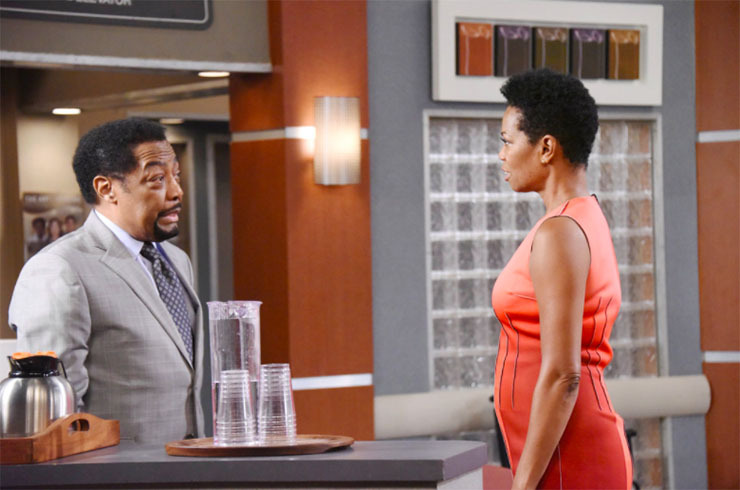 The Days of Our Lives spoilers for Wednesday, May 10th, predict that now that Abe found the partner he’s wanted to help him with Valerie/Eli, they hatch a plan. Gotcha–In a Helpful, Healing Way! Abe (James Reynolds) had asked Valerie to ask Eli (Lamon Archey) to agree to bury the hatchet with Valerie (Vanessa Williams) a while back. That never really got him what he wanted, which is happiness for his well-meaning, kind-hearted partner, Valerie. Now he has Gabi (Camila Banus) in his corner. The two trick Valerie and Eli in the hopes of getting them to hug and make up Wednesday. Related: Vote in our poll or the comments for your fave Salem couple! Remember the other day, when Chad (Billy Flynn) asked Kate (Lauren Koslow) if she was comfortable searching for the amulet, given all the bad energy associated with it over the millennia? Amulets are powerful, right, dear Soap Cities readers? And when you add to that power bad karma–eek! Perhaps this is what Hope (Kristian Alfonso) and Andre (Thaao Penghlis) have in mind when they try to stop Chad from getting his hands on the talisman. Also: Mary Beth Evans got a very special honor recently. Brady’s (Eric Martsolf) condition is deteriorating fast, and Marlena (Deidre Hall) is frantic to reach John (Drake Hogestyn). What? Who? When? Where? How? Why? Don’t Miss: Chandler Massey is coming home to Salem! No, this is not an introductory course in journalism. It’s a description of how Nicole (Arianne Zucker) probably would describe the her reaction when she is taken by surprise at the villa Wednesday!